As civil activists and ordinary people celebrated yesterday’s announcement by Mayor Taron Margaryan that the rise in bus fares would be suspended, many also realized that it is just a temporary respite and more efforts are still needed to complete what has been described as another civil society victory in Armenia. “Mayor Taron Margaryan simply announced the suspension and not cancellation of his two decisions of July 19, 2013. It means that the two mentioned decisions may become valid again when the wave of public protest subsides and the commission to be set up finds that the ‘frozen’ decisions should be revitalized,” said Stepan Safaryan, a member of the Yerevan Council of Elders with the opposition Hello Yerevan faction. Safaryan said that a group of their lawyers would continue to work in this direction, and he did not exclude the possibility that these ‘frozen’ decisions will be disputed in court. In an address to the public on Thursday Mayor Margaryan, in fact, bowed to pressure from civil activists, who have been demonstrating against bus fare hikes for days. He said that while the decision remained suspended a commission of specialists will be set up to work on mechanisms to ensure that the socially vulnerable groups of the population are not affected. Still, the mayor described the unpopular measure as beneficial for the city and its transport system in the long term. He said that increasing the public transport fare from 100 drams (about 25 cents) to 150 drams is the price that has to be paid. “We simply have no alternative,” he underscored. After the announcement of the suspension of the decision many young men and women in Yerevan again took to the streets but this time to celebrate their victory. 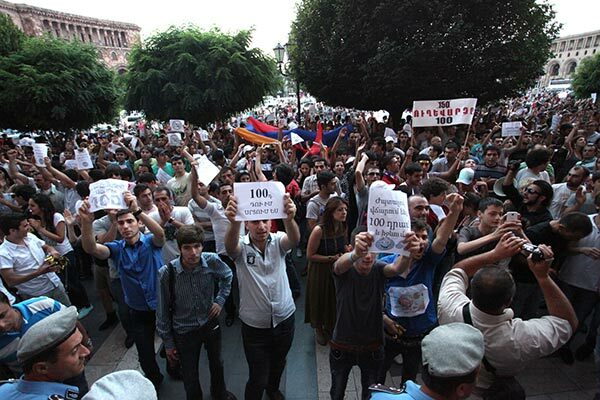 Armenian users of Facebook and other online social networks were also celebrating the success of the movement that was dubbed ‘100 Drams’ congratulating each other by sharing posts, photographs and videos of memorable moments. Meanwhile, lawyer Vahe Grigoryan said that what the mayor did was simply avoiding responsibility. Had he canceled his decision instead of suspending it he and all persons who enforced its application would have had to take the consequences for it, he said. “This decision must be invalidated, if not by him then by court. The rest is just empty talk. The only way to finish this case is to achieve the invalidation of this decision and to bring those who made it and enforced it to account,” said the well-known lawyer. Members of the ‘We Pay 100 Dram’ civil initiative plan to gather near the municipality building later today to make their demands to the mayor regarding transportation system reforms, including the demand that his controversial decision to raise bus fares be invalidated rather than just suspended.